Successfully Added 4K Android TV Box Mecool M8S Pro - Android 7.1, Octa-Core CPU, 3GB DDR4 RAM, Dual-Band WiFi, DLNA, Airplay, Miracast to your Shopping Cart. With this Android TV box in your living room, you’ll be able to throw ultimate movie and gaming nights for all your friends and family. Supporting breathtaking 4K resolution, this 4K TV box brings forth absolutely stunning detail and vivid color for those of you that own a 4K TV set. Thanks to this Ultra-HD resolution, you’ll be able to enjoy movies, series, games, and sports like never before. Invite over all your friends or simply spend a relaxing evening at home with your family – this Android TV box is guaranteed to bring hours worth of joy and entertainment into your household. With its compact design, this 4K TV box can be conveniently placed anywhere in your living room without taking up any space. Packed within its small body, you’ll find a powerful Octa-Core processor and 3GB of DDR4 RAM. Together, these pieces of hardware deliver an exceptional user experience that allows you to take on the most demanding games, movies, and Applications without dropping a frame. Supporting both Google Play and Kodi TV, this 4K TV box provides you with free access to an unlimited pool of entertainment – ensuring that you’ll never have to feel bored again. Packing 16GB of internal storage, there will be plenty of space for you to store your latest downloads. The TV box furthermore allows you to slide in a 32GB SD card that can be filled with your favorite media. With its Dual-Band WiFi connectivity, you’ll be able to browse the web, stream movies, and download any sort of entertainment in the blink of an eye. 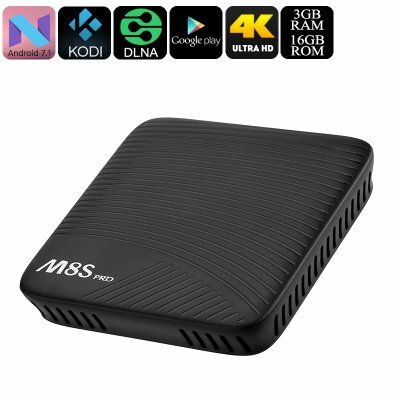 Additionally, this 4K TV box supports features like DLNA for easy data sharing as well as Miracast and Airplay to mirror anything that’s happening on the display of your mobile device straight onto your big screen TV. Everything was good, shipping was excellent, keep using that method of Shipping unless otherwise required. Another great purchase from Chinavasion which arrived on time yet again..Very well packaged and the item works great and is everything they said it would be..Great company to do business with and Alex from customer services has been the best with keeping in touch. Thank you Chinavasion. For the extra few bucks on delivery use DHL. Well worth it. Fantastic device! This is the second one I have owned, the first I have purchased. Chinavasion is my goto for gadget electronics. the reason? Service, reliability, commitment to customer satisfaction and quality product. I received it and like it so far. Hope it preform as expected.